October 04, 2016, 4:20 p.m.
London is one of the world’s great cultural centres, stuffed with museums, galleries and landmarks of international renown. But many, if not most, of the visitors to London’s attractions are tourists and other visitors to the city – which are the attractions that Londoners themselves go to? New research by YouGov finds that the Natural History Museum is the attraction that the most Londoners have visited, with 69% saying they have been. After that comes the Science Museum (66%) and the London Eye, London Zoo and Tower Bridge (all on 65%). The Globe Theatre came bottom of the list of 20 attractions, with just a third of Londoners saying they have visited the venue. 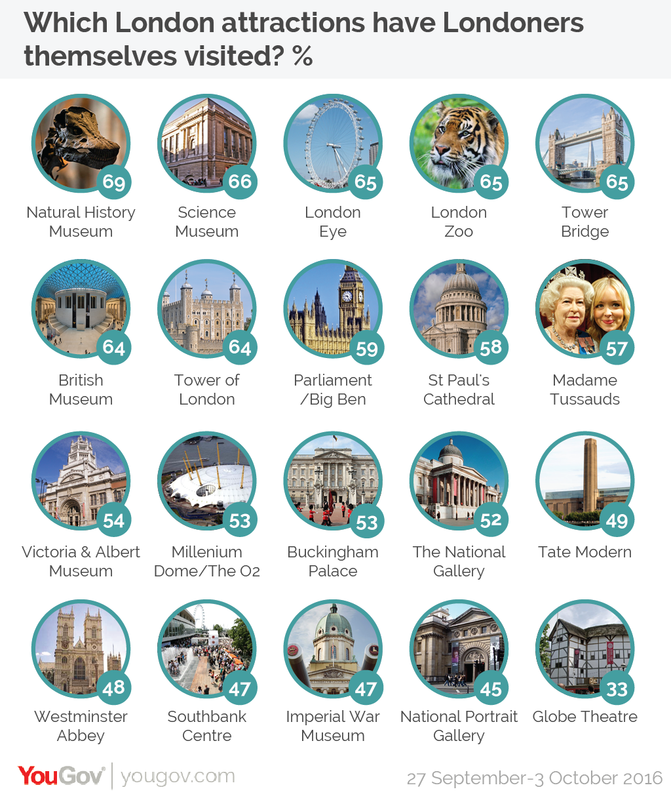 People can often be bad at making the most out of what is on their doorstep, but the survey finds that at least half of Londoners have visited 14 of the 20 attractions on the list. Generally speaking, the capital’s young people tend to be less likely to have visited an attraction – unsurprising given that they will have had few opportunities in which to do so. The attraction they are most likely to have visited is the London Eye (71%). Young Londoners are particularly less likely to have visited famous religious buildings than their elderly counterparts – those over the age of 65 are 38 percentage points more likely to have gone to St Paul’s Cathedral than 18-24 year olds, and 37 percentage points more likely to have been to Westminster Abbey. Along with Madam Tussauds – which young people are also much less likely to have visited – these are by far the highest distinctions between the age groups. Despite the government making many museums free to enter back in 2001 in order to provide people with cultural opportunities regardless of income, working class people are still much less likely to have visited any of the attractions on this list. There is a single exception to this – Madame Tussauds, which is the only attraction working class people are about as likely to have visited as middle class people (56% vs 57%). Men and women are broadly similar in the attractions they visit, although there are a few distinctions. Men are much more likely than women to have visited the Imperial War Museum, whilst women are more likely to have gone to try and get a glimpse of Her Majesty, either at Buckingham Palace or Madame Tussauds.